Some people have such a great sense of humor, they reflect it on their tombstones. This was the thought I tried to convey when I responded to Teri Sforza’s recent e-mail. She included it in the first piece below on the realization that pension liabilities have grown like wild fire since SB 400 was signed by Governor Gray Davis back in 1999. The County of Orange is not immune, as the following graph that I’ve provided in past UPDATEs will show. It was updated and included in the first and second pieces from the OC Register below. The third piece has the Voice of OC addressing a supplemental item that will be on next Tuesday’s Board of Supervisor’s agenda. The suspension of COIN is being recommended (see MOORLACH UPDATE — Seeking Independence — July 3, 2015 July 3, 2015 John Moorlach). The joys of this proposal never seem to cease. My appreciation goes to Supervisor Michelle Steel for her public stance on this ordinance. The fourth piece in the Newport Beach Independent honors Paul Watkins as the Newport Beach Chamber of Commerce Man of the Year. I just happened to be at the right place at the right time when Paul was notified of this prestigious award. 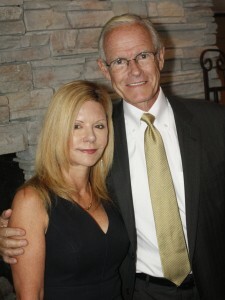 Ronnie Watkins’ son graduated from the College of Business Administration at California State University Long Beach last May, where I had the privilege of participating in the ceremony (see MOORLACH UPDATE — Distinguished Alumni — April 5, 2014 April 5, 2014 John Moorlach). Congratulations, Paul and Ronnie! Pension hole: Once modest, now monstrous How did the gap widen 3,046 percent in 11 years, and can it get worse? Within the span of only 11 years, the hole at the bottom of California’s state and local pension funds increased a staggering 3,046 percent. The monstrous growth of the gap between what public agencies have promised workers upon retirement and what they actually have – from $6.3 billion in 2003 to $198.2 billion in 2013, according to figures gathered by the State Controller’s Office – matters to all Californians, reformers argue. If it’s not filled up with meatier investment earnings and heftier contributions from public workers and employers, that hole will continue to expand, and taxpayers must fill it directly. Why? Because in California, the promises made to public workers on Day One of their employment can never, ever be broken – at least, not outside of federal bankruptcy court. And even in court, officials from Vallejo and Stockton and San Bernardino did not request permission to modify these burdens, fearing they’d have trouble attracting and retaining workers if the city next door offered something better. This fear of competition, the “keeping up with the Joneses” impulse, or whatever you’d like to call it, also fueled the widespread embrace of super-sweetened, retroactive retirement formulas at public agencies large and small in the early 2000s. Public labor unions say the focus on unfunded liabilities “is a little worrisome.” Unfunded liability is not debt and shouldn’t be viewed that way, said a spokesman for Californians for Retirement Security, a coalition of unions trying to protect the current system. Unfunded liabilities are different because what’s owed is not a hard-and-fast number, as is money borrowed through public bond debt. Instead, pension liability numbers depend on many moving parts and assumptions, including annual returns on investments. When the market booms, returns are great and liabilities get smaller. When the market tanks, liabilities grow. Such “don’t worry” talk outrages reformers. “For citizens and taxpayers, unfunded pension liabilities are actually more of a burden than bonded debt,” said David Crane, a research scholar at the Stanford Institute for Economic Policy Research. That’s because they tend to rank higher in priority in bankruptcy proceedings than other kinds of debt and are repaid first. He pointed to New York City’s woes in 1975, when it suspended interest payments on debt but kept paying pension liabilities. “Put another way, unfunded liabilities are more sacrosanct than conventional debt, and therefore more of a burden for citizens and taxpayers,” Crane said. Debt, liabilities – call it what you will. These numbers will be subtracted from public agencies’ balance sheets beginning next year. How did we get here? 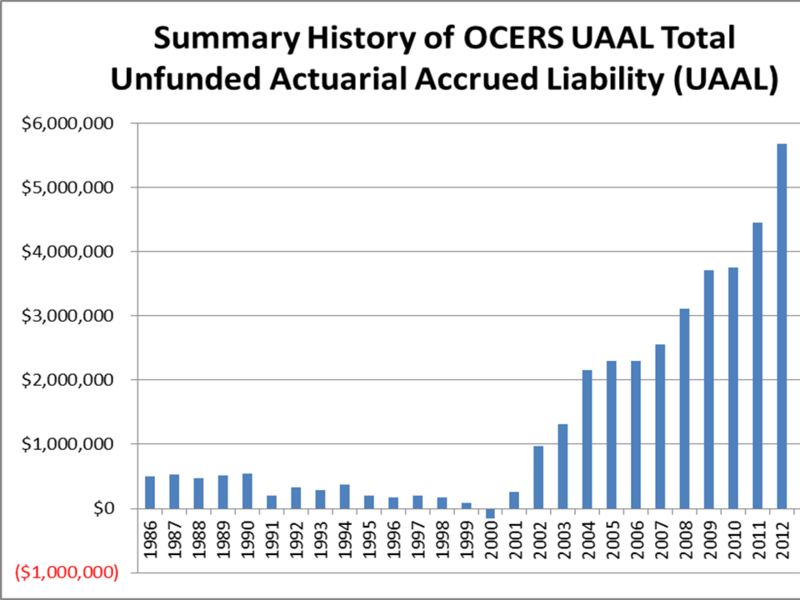 Critics say the answer lies in that tremendous spike in unfunded liabilities from 2003 to 2004. In 2003, the hole in California’s 80-plus public pension systems totaled just $6.3 billion. But in 2004 – virtually overnight – it exploded to $50.9 billion. That was the work of new, more generous, retroactive retirement formulas adopted by one public agency after another in the early 2000s, said ‍Moor‍‍lach, a certified public accountant. Meaning this: Agency A had been socking money away for Police Officer B’s retirement for decades. When Agency A adopted sweetened pension formulas, it suddenly was committed to paying Police Officer B quite a bit more every month for the rest of his life – even though no one had ever set money aside to cover a pension that large. Officials thought pensions were so super-funded that this retroactive thing would not come back to bite them. Oops. Add in “pension holidays” (when funds looked so healthy that officials quit putting money into them, sometimes for years), a crippling recession, lengthening life spans, a spike in retirements and reductions in what pension plans expect to earn on investments, and you get a hole $198.2 billion deep. Or deeper. These official liability totals are computed assuming a 7.5 percent or-so return on investments, which critics say won’t pan out over the long haul. If one assumes lower return rates – as did Joe Nation of the Stanford Institute for Economic Policy Research – the hole can easily double. SB 400 lowered retirement ages for general state workers, from 60 to 55, with pensions paying 2 percent of salary for each year worked. It based pensions on the highest single year’s salary rather than an average over three years. And it gave patrol officers the most generous formulas the Golden State had seen: 3 percent of salary for each year worked, beginning at age 50, vs. the previous 2 percent at 50. The bill was a creature of its time. The stock market was booming, retirement costs had been dropping for a decade, and the California Public Employees’ Retirement System said it could fund sweeter benefits with a combination of high returns and accounting adjustments. The cost of benefits snowballed, particularly for public safety personnel, and the market tanked, wiping out billions. Even with the market recovery of the past six years, unfunded liabilities are high and growing. “The financial meltdown took place in 2008, and the stock market bottomed in 2009. Since then the market has gone up 2.5 times and reached all-time highs – and yet the controller’s numbers show how the unfunded liability keeps growing,” said Stanford’s Crane. The result: Public agencies are pumping more money than ever into pension systems to try to fill the hole, which critics say siphons money away from services. CalPERS has hiked annual contribution rates for public agencies 30 percent to 50 percent to erase unfunded liabilities over the coming decades and will keep rates high for the foreseeable future. CalPERS places the overwhelming majority of blame for increasing costs on the stock market crash and changes in actuarial assumptions (increasing longevity, smaller investment returns), as well as a larger payroll. SB 400 and other benefit changes account for less than a quarter of increased costs, officials said. A Register analysis found that surging tax revenue is easing the bite of these increases – in some cities more than others. But analysts say weak investment returns over the past year put further stress on the system. CalPERS officially expects a 7.5 percent return per year on its portfolio of stocks, real estate and other investments. In July, it announced preliminary earnings of just 2.4 percent – which will make those unfunded liability numbers grow. “The weak 2015 investment performance is credit negative for California and most of its local governments because it adds to growing pension funding and demographic challenges,” said rating agency Moody’s Investors Service in its latest Credit Outlook report. Change for CalPERS – but is it enough? It’s not like folks aren’t trying. To bridge the stunning gap between what’s owed for retirement benefits, and what public agencies actually have, CalPERS and other pension systems are requiring higher annual contributions from employers and workers. The governor’s 2013 pension reforms lower benefit formulas for new hires and require them to kick more into the kitty. They also outlaw retroactive benefit increases, so future politicians can’t get California into quite the same squeeze as the last batch did. But those changes don’t do enough to address current woes, critics argue. State Sen. John Moorlach, R-Costa Mesa, is at work on a reform proposal to introduce in the next Legislative session, and an initiative by former San Jose Mayor Chuck Reed and former San Diego councilman Carl DeMaio is aiming for the November 2016 ballot. The Voter Empowerment Act would require voter approval for guaranteed pensions for new public workers, as well as voter approval for pension increases for current workers, as of 2019. Supporters say it would give local governments more tools to help rein in unsustainable pension costs that take dollars away from services. Opponents say it would gut public pensions and eliminate guaranteed retirements across the board. Orange County supervisors are slated to vote next Tuesday on whether to suspend a labor negotiations law they enacted last year known as COIN, in light of a recent state ruling that invalidates parts of the ordinance. In his staff report, County Counsel Leon Page says the suspension is necessary to protect the county from further legal liability. “In order to avoid claims of a failure to negotiate promptly upon request…staff recommends that the Board" suspend the ordinance until the litigation surrounding it has finished, Page wrote. COIN, which stands for Civic Openness in Negotiations, requires public disclosure of offers and counter-offers during supervisors’ negotiations with public employee unions, and the posting of proposed agreements 30 days in advance of voting on their approval, among other things. Last month, the state’s Public Employment Relations Board ruled that county supervisors violated labor laws because COIN imposed new requirements on employee negotiations without giving unions a chance to negotiate about the changes ahead of time. If the ruling stands, the county would have to repeal four key sections of COIN, including public reporting of offers and counteroffers, disclosure of what took place during labor negotiation sessions, a 30-day non-negotiations period before supervisors consider opening proposals to labor groups. The county has since asked the full PERB board to overturn the ruling, taking issue with many of its conclusions. COIN was brought forward last year by then-Supervisor John Moorlach, who argued that it will give residents a better chance to weigh in on proposed labor agreements. Supporters, such as the conservative Lincoln Club of Orange County, also suggested the ordinance would help prevent labor costs from escalating due to benefit increases. Labor groups, meanwhile, argued that COIN triggers a requirement to meet and confer with employees under the Meyers-Milias-Brown Act, which mandates certain types of communication between government agencies and employee groups regarding labor negotiations. They also criticized supervisors for not having the ordinance cover all government contracting, especially with private companies that finance the supervisors’ political campaigns and account for more than half of the county’s spending. In his proposal for next week, Page is asking for the suspension to take place immediately, which requires approval from four of the five supervisors. And because Supervisor Lisa Bartlett is scheduled to be on vacation next week, the measure will likely need support from the rest of the board to pass. That could mean the proposal won’t passbecause Supervisor Michelle Steel has indicated she doesn’t support it. “I believe this item is premature and we should wait for the appeal process to play out before making such a drastic change in course,” Steel said in a statement Thursday. The rest of the board members didn’t return messages seeking comment. You can contact Nick Gerda at ngerda, and follow him on Twitter: @nicholasgerda. Paul Watkins thought he was stepping into a meeting, but when he ambled into the dining room of the Bahia Corinthian Yacht Club, he was greeted by a sea of familiar faces and a round of applause. 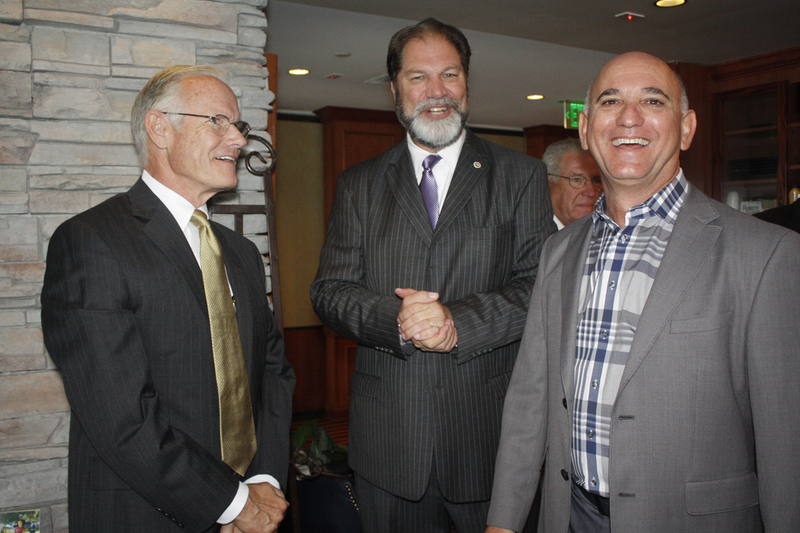 “Congratulations Paul, you’re the 2015 Newport Beach Citizen of the Year,” said Steve Rosansky, president of the Chamber of Commerce, who guided Watkins into the celebration. Watkins was caught off guard and genuinely surprised, but everyone in attendance agreed he was the perfect choice. The Citizen of the Year Award was first handed out in 1949. Among the many notable names on the list are Joseph A. Beek (1955), William “Bill” Spurgeon (1958), Carroll Beek (1961), Judge Robert Gardner (1968), George Hoag (1974), William D. Lusk (1984), Art Gronsky (1992), Marian Bergeson (1998), Seymour Beek (2005), Evelyn Hart (2007), Ralph Rodheim (2010), Tom Johnson (2011), Jean Watt (2013), and Jack and Nancy Skinner (2014).